In four seasons as crew chief for driver Kevin Harvick and the No. 4 team of Stewart-Haas Racing (SHR), Rodney Childers has built the fastest and most consistent racecars in the Monster Energy NASCAR Cup Series. Since the first preseason test in December 2013 at Charlotte (N.C.) Motor Speedway, the No. 4 car has maintained the most speed and scored the most points in the NASCAR Cup Series garage. Childers, Harvick and the No. 4 team thrive amid the pressure to perform, which is exemplified by having reached the Championship 4 at Homestead-Miami Speedway three times in the last four years and punctuated by their crowning as 2014 NASCAR Cup Series champions. Childers started the 2014 season with a blank sheet of paper and built the No. 4 team from scratch with new employees, new equipment and new racecars. Despite all the newness, Harvick’s winning ways remained constant. In just their second race of the season at ISM Raceway outside Phoenix, Childers and Harvick scored their first victory in dominating fashion by leading 224 of 312 laps. The second win for the new team came just six races later in the Southern 500 at Darlington (S.C.) Raceway, where the No. 4 car started from the pole and dominated again, leading 238 of 374 laps. While the pure speed of the No. 4 team was impressive, so was its determination and belief, no matter the odds. Childers, Harvick and the No. 4 team won three races in the NASCAR Playoffs, not just by surviving each cutoff round, but by creating their own destiny. Wins at Charlotte, Phoenix and Homestead-Miami Speedway set their course to the title. The team finished the 2014 season with five wins, eight poles and 2,137 laps led, becoming only the third team to lead more than 2,000 laps in a single season since 2000. Of the 24 track qualifying records set during the 2014 season, the Childers-led team accounted for six of them. No other team had more than four. Harvick and Childers picked up in 2015 where they left off in 2014 and were in position to successfully defend their crown until the final race at Homestead. They closed out the 2015 regular season with 978 points in the 26-race regular season. The No. 4 team’s total prior to the playoffs was the most under the points system introduced in 2011, surpassing the 914 regular-season points scored by Greg Biffle in 2012 and Jeff Gordon in 2014. The No. 4 team won three races, including back-to-back races at Las Vegas Motor Speedway and Phoenix in March, and established new single-season bests with 23 top-five finishes – including 16 top-twos – and 28 top-10s through the 36-race season. However, the No. 4 team finished one point short of its second consecutive NASCAR Cup Series title. With Childers on the pit box, Harvick also led 2,294 laps to eclipse the 2,000 laps-led mark for the second season in a row, becoming the first driver to lead more than 2,000 laps in back-to-back seasons since Gordon in 1995 and 1996. Childers, Harvick and the No. 4 team pushed the limits again in 2016 by scoring four wins, two poles, 17 top-five finishes, 27 top-10s and finishing eighth in the championship standings despite recording the best average finish and scoring the most points on the season. The No. 4 team finished the regular season with 876 points – more than any other team. It marked the second consecutive season they led the points after the 26-race regular season. The No. 4 team is the only outfit to lead more than 1,000 laps in a season from 2014 through 2016 and score an average finish below 10.0 in both 2015 and 2016. The 2017 season again provided Childers with a unique challenge as Stewart-Haas Racing made the move to Ford as the team’s engine supplier and technical partner. The transition meant additional personnel, a new body design, building and designing chassis in-house and new software to learn. Childers again stepped up to the challenge and led Harvick and the No. 4 team to two wins, four poles, 14 top-fives and 23 top-10s. The team scored its first win of the season at Sonoma (Calif.) Raceway in June and its second at Texas Motor Speedway in Fort Worth in November. In four seasons together at SHR, Harvick and Childers have paired to win 14 races, 15 poles and finished first, second, eighth and third in the final point standings. The team also has led 6,665 laps in the past four seasons, which is more than the 4,426 laps led in Harvick’s previous 13 seasons combined. In his 144 NASCAR Cup Series races since joining SHR, the No. 4 team has scored 39 top-twos, 68 top-fives and 98 top-10s. Childers’ ascension to the top of the NASCAR Cup Series didn’t start with him under the hood of a racecar or on top of a pit box calling the shots. It started in the driver’s seat of a go-kart. Childers grew up right in the middle of NASCAR country in Mooresville, North Carolina, a small town commonly referred to as “Race City USA”. Unlike many of those around him, Childers didn’t grow up in a family of racers. He had one uncle who occasionally tinkered with a dragster and another uncle who sporadically raced on dirt tracks, but Childers wasn’t exposed to racing at an early age. His father was a car salesman and his mother was a stay-at-home mom who made quilts in her spare time. Childers’ first racing experience came at age 12 during a trip to a local go-kart track. His friend raced and, as Childers looked on, he was instantly hooked. He knew he wanted to race and needed a go-kart, but money was tight. That was until Childers’ mother, Brenda, who at the time used her handiwork to create intricately patterned quilts to earn the family extra money, started a new quilt to help buy Childers a go-kart for Christmas. When Childers started racing, he would set up his go-kart and load it into the back of the family pickup truck. He and his mom would go to the racetrack each weekend. She would help by warming up his engine before the race and then cheer for him in the stands. Childers was a natural behind the wheel, and it wasn’t long before others took notice. Within a year, Childers reached a deal to drive for a go-kart shop with some financial backing. From that point, Childers’ nascent driving career began to blossom. He won seven World Karting Association championships in South Carolina and five championships at the national level before moving to Late Model stock cars in 1997. The beginnings of a career as a crew chief began to take shape, but Childers’ focus remained behind the wheel and trying to make it to the next level. From Late Model stock cars, Childers moved up the ranks by competing in the All-Pro Series and the Hooters Pro Cup Series. His only NASCAR Xfinity Series start came in June 2000 at Myrtle Beach (S.C.) Speedway for Jay Robinson Racing. Unfortunately, his race was brief after he was collected in an accident. Childers tried out for various rides and sought opportunities that would keep him behind the wheel, but nothing materialized. In 2003, he made the difficult decision to hang up his helmet, but he wasn’t going to hang up on his dream of working in racing. Instead, Childers altered his dream. He was just as talented working underneath the hood as he was behind the wheel, so he turned his focus to working on racecars. Childers proved to be such a talented mechanic that he got his first job at Penske-Jasper Racing working on the No. 77 NASCAR Cup Series entry on the same day he interviewed with the team. His climb from mechanic to crew chief was just as swift. He moved from mechanic to car chief on the No. 77 car for the 2004 season. 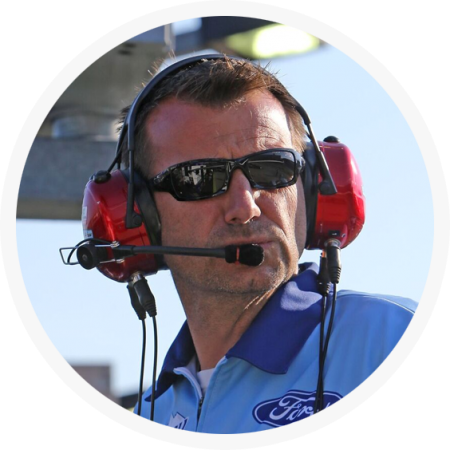 In June 2005, he was hired as crew chief for Scott Riggs at MB2/MBV Motorsports and the duo quickly produced a second-place effort in August at Michigan International Speedway in Brooklyn. Childers moved with Riggs to Gillett-Evernham Motorsports at the beginning of 2006. During the 2006 and 2007 seasons, the pairing scored two poles, one top-five finish and nine top-10s. With three races remaining in the 2007 season, Childers moved within Gillett-Evernham and took over as crew chief for the No. 19 team with driver Elliot Sadler. With Childers calling the shots, Sadler scored two top-fives and eight top-10s in 2008. In 2009, Childers was hired by Michael Waltrip Racing (MWR) to serve as crew chief of the No. 00 team and driver David Reutimann. Childers earned his first trip to victory lane as a NASCAR Cup Series crew chief when he guided Reutimann to the win in the rain-shortened Coca-Cola 600 at Charlotte in May. It was Childers’ first victory as a crew chief, Reutimann’s first NASCAR Cup Series win and the first NASCAR Cup Series win for MWR. Childers and Reutimann scored a second victory the following season at Chicagoland Speedway in Joliet, Illinois. In three years together, they combined for two poles, two wins, 12 top-fives and 21 top-10s. “Every win is special, especially your first,” Childers said. “I think when we won Charlotte – our first win at MWR – it was a rained-out race so it wasn’t really a win. It was a win to our company, but it wasn’t a win to everyone else in the garage. When we came back the next year and won Chicago and led a lot of laps and had the best car, that was probably the one that felt the best. That was almost more like the first win. The 2012 and 2013 seasons presented Childers with a different challenge as driving duties for the newly renumbered No. 55 car were shared by Mark Martin, Michael Waltrip and Brian Vickers. Childers juggled working with the different personalities and driving styles with ease. The team finished 15th in the owner championship in 2012 with four poles, seven top-fives and 16-top 10s. In 2013, Childers guided Vickers to an impressive win in July at New Hampshire Motor Speedway in Loudon. The following month, Childers decided to leave MWR to prepare for his new role at SHR as Harvick’s crew chief. Childers resides in Mooresville with his wife Katrina and his twin boys Gavin and Brody.